Tasty organic biscuits. Apple pieces. With cinnamon sprinkles. Contains no: hydrogenated fats, palm oil, artificial preservatives, colourings or flavours. Suitable for vegetarians. 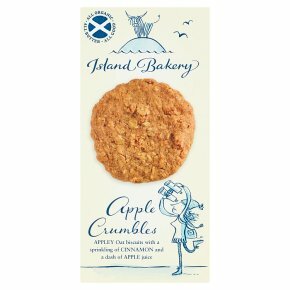 A truly fruity fix where apple chunks, oats & juice embrace under a light cinnamon sprinkling Organic indulgence from the Hebrides The Isle of Mull is renowned for wild and unspoilt landscapes and its welcoming islanders. It's our home, and where we make these particularly characterful biscuits. We mix only the best organic ingredients, and bake them using unique ovens that are heated by Mull's plentiful renewable timber. Like our organic ingredients this is not only environmentally sustainable, but the gentle heat gives a slow, perfect bake. Our mixers whizz with clean hydro-electricity generated on the Tobermory river that flows past our bakery. This works best on Mull's frequent rainy days... every cloud has a biscuit lining!